Whether using spirals or rounds, when switching colors, I recommend the tutorial over on NeedleNoodles – I gave it a try and it’s fantastic! It’s absolutely my go to technique for jog-less stripes from now on. I just found your website today. I have enjoyed watching the tutorials you’ve made. 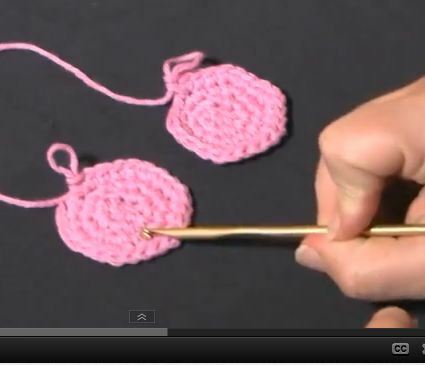 I had been wondering the best way to join the ending stitch on a round to a beginning chain to avoid seeing seams when making Granny squares or any square patterns. 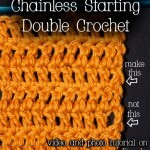 I’m not sure which part of the chain to put the ending stitch through. Thank you for all the great crochet info. Angel, thank you! 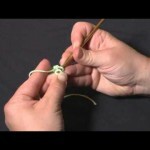 If you are cutting the yarn and adding a new piece, then you can use the seamless join method to finish the row. Otherwise, just a slipstitch into the top ch of the round’s starting chain, as far as I know. I’m looking for a pattern for an Ernie doll (Muppet character). Can you help me? I just found your page today (sent from Tangledhappy for the Hhdc tutorial) and have clicked and clicked on many of your tutorials! I’ve even watched videos to things I feel like I already know in case you’ve got some juicy advice! I have made several beanie-type hats and cowls that work in a spiral, which I like, but I always hate the “finish”. Do you have advice on how to get the spiral back to an even “look” for the finish? I always have to work and work to hide the “notch” and it never really disappears.